How Does Bridge Work For Brands? You sign up online for a free Bridge account. For free, you can share products, news, and files with your retailers and sales reps via Bridge. If you wish to sync your products with more than 10 retailers via Bridge's network, you may graduate to a paid plan. If you choose to sync products, we'll ask you to sign a Bridge agreement. Next, we'll import your items into Bridge. Our Bridge team will import your product data from an Excel file that you email us. There is a one-time $79 setup charge for our team to do this setup work. We can also help you add pictures to these items. Using our software, you will in essence be creating a duplicate of what is on your website on the Bridge platform. The benefit is that once you do this your products will appear on all your authorized retailers' websites and consumers can purchase your items on these retailers' sites. Any changes that you make to your Bridge products will also occur on your Bridge retailers' sites instantly. For example, if you add a new item, it will appear on all your Bridge retailers' sites. If you change a price, it will change on all the sites. Your items from the retailers' perspective appear to be self-updating and 'smart.' Therefore, we refer to your items as Smart Products and to your brand as a Smart Brand. We'll give you a free training session about how to update and organize your Smart Products. Once you are happy with the presentation of your products in your account, we'll active it. You'll send sync requests to the retailers with which you wish to sync products. Your Smart Products will appear on your friended retailers' websites. Your Bridge retailers will no longer need to ask you for Excel files to upload to their site. You can invite any retailer to join Bridge and sync with your Smart Products. When a retailer sells one of your items on its site, the retailer will receive the customer's order via email. If the retailer has the item in stock, it will ship what it has in stock. If the retailer does not have the item in stock, it will contact you or its sales rep to place an order. If you drop ship, it may ask you to do this. To help you measure your Bridge's performance, Bridge will send you a daily email informing you of any sales relating to your brand. 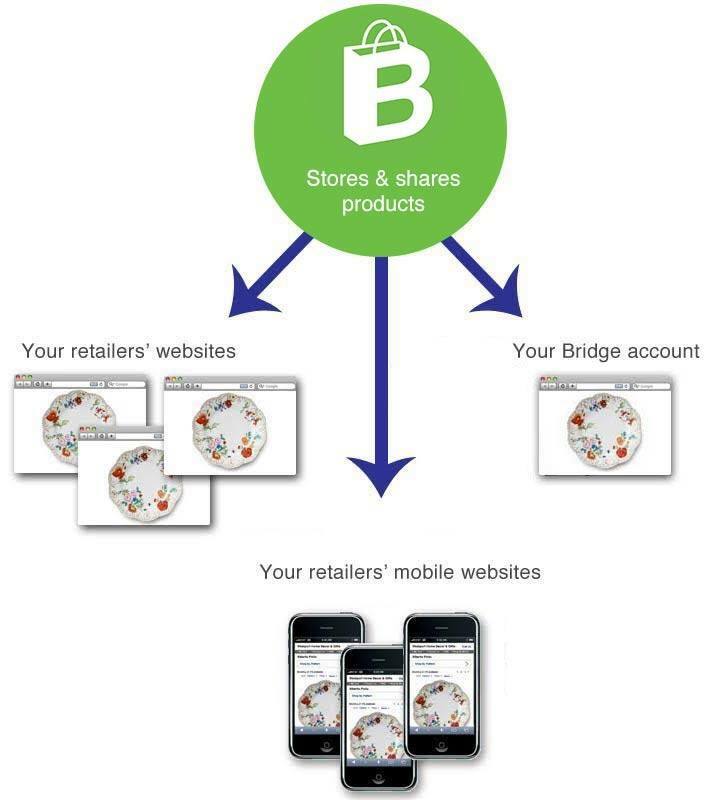 Using Bridge, you control your product on your retailers' websites and help them show more and sell more. You'll speed your product to market and streamline communication. Bridge is a free, secure platform on which your business can store and share 1,000s of products (with pictures, prices, and descriptions) with your retailers. Your retailers can use your products shared via Bridge to power their websites and gift registries. You can control how your items appear and are organized on your retailers' websites. Currently, 100+ brands use Bridge to promote 61,552 products on 300+ retailers' websites. More easily show and sell your products on your retailers' websites. Increase the quantity of your product offered on retailers' websites. Increase the number of retailers selling your product. Control how your brand is presented online, including more control over your pricing, picture quality and descriptions. Use Bridge as an advertising platform to efficiently promote your products to existing and potential clients. Do you hate paying for thumb drives, logging into Dropbox, or formatting Excel sheets? Most businesses do. Skip relying on these tools to share products. With Bridge's Smart Products service, your items instantly appear in all the right retail spots. Most brands e-mail retailers a Dropbox link with an Excel file and images. This is very inefficient. What if there was an instant way to share these products? There is: Smart Products. Smart Products let you bypass Dropbox and Excel. You can use Smarts Products to save time and cut costs. Let's imagine your retail stores would like to add Herend (a producer of fine tableware and giftware) to their websites. Herend offers 4,000 SKUs. Using the Smart Products program, Herend shares these 4,000 products with its retailers instantly. If a store were to add these items manually without Bridge, it would pay someone $100s and require a week or more of time. With Bridge, it costs the store $0 and the items are online in minutes. Bridge requires less time and less money than Dropbox and Excel. Slow. Often requires manual processing and uploading to a website. Fast. Products can appear on retailer sites instantly. Requires computer savvy staff. Doesn't require more staffing. Maintenance-free product management. Inaccurate. An indie store maintaining tens or hundreds of brands' prices and content is nearly impossible. Accurate prices and product content because Smart Brands are maintain their respective items. Slow and expensive. Requires constant downloading of Excel files and images, and then uploading this to retailer's website. Fast and cost efficient. After one-time sync, all data from your brand is 'live' on your retailers' websites. Brands often send files to multiple emails and accounts, thereby creating many files in different locations. Use one Bridge account to share products and pricelists with hundreds of retailers. Not intuitive. Files don't appear in context. Dropbox files are often unorganized and not organized like a website nor catalog. Intuitive. Products appear next to relevant files. Eg: Waterford products appear next to Waterford files. Stores often show just a fraction of what the brand offers online. Reason: the stores have to manually download content from Dropbox and add it to their sites. Stores often display 100% of a brand's products online. The Smart Products platform makes doing so quick and easy. How Do Smart Products 'Work'? When you make your products 'Smart Products,' you're placing them in Bridge's database. This database only shares your products with those retailers, sales reps, and businesses with which you've told it to share your products. Do You Want to Sell 13% More? Retailers reported that they sold 13.5% more product when they used the Smart Products service. 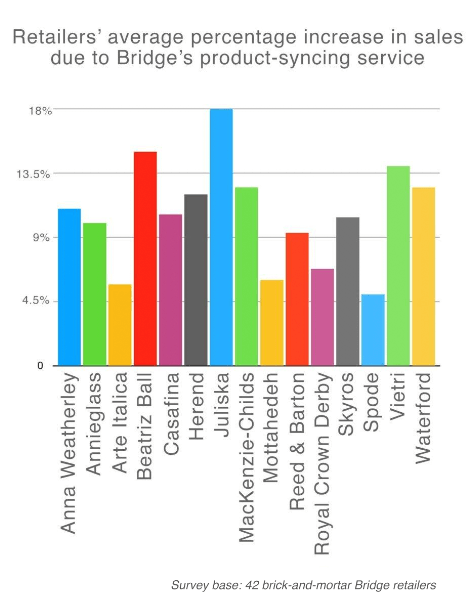 In another study conducted by DeVine Corporation (which distributes Anna Weatherley, Royal Crown Derby, and Couzon), retailers that used Bridge also reported selling 13% more than those that did not use the program. Which Brands Use the Smart Products Service? Most retailers show on their websites a fraction of what a brand offers. Due to this, they are receiving fewer orders from the general public and from other customer bases such as gift registry customers. This hurts the retailer and the brand. The Smart Products service fixes this problem. 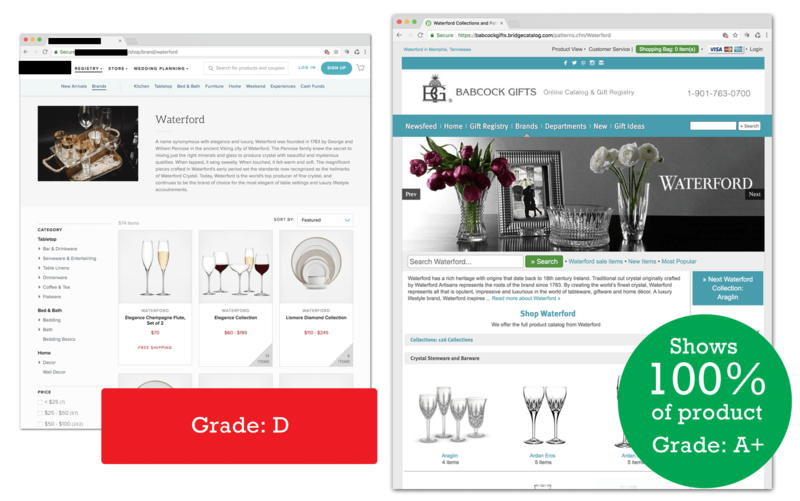 View an example of how Smart Products help a brand show more product on retailers' sites. Email us an Excel file with your products. Bridge will help you import your product data. Bridge will show you how to manage your items via your Bridge account. 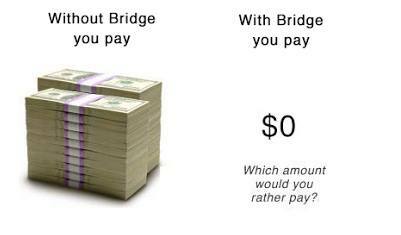 You choose who sells your product via Bridge. Your products will appear on authorized retail Bridge partners' websites. You can add, edit, and delete products. Your changes will take place in real-time on the retailers' websites. Read more about how Bridge works for brands on the How Does Bridge Work? page. How Do You Add Your Items to Bridge? Excel is a poor tool to share products between many businesses--but it does serve a purpose. It's one way to enter your products into Bridge. You can either use our user interface to enter products or e-mail us an an Excel file.